Anthony’s Pronto Kitchen, an Italian takeout and delivery only concept by Anthony Bruno, opened it's doors to offer restaurant quality food with the convenience of in-home dining to Fort Lauderdale. 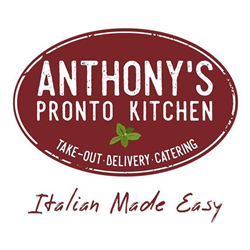 Anthony’s Pronto Kitchen, an Italian takeout and delivery only concept by Anthony Bruno, founder of Anthony’s Coal Fired Pizza, Andy’s Live Fire Grill and Bar, and Anthony’s Runway-84, opened its doors on Saturday, March 2nd at 11:00 a.m. Inspired by rising consumer demand for restaurant quality Italian food with the convenience of in-home dining, the concept of Anthony’s Pronto Kitchen was born as a collaboration between Anthony Bruno, Dan Marino, and the founding team of Anthony’s Coal Fired Pizza. The founders of the restaurant have set out to introduce the idea of “Italian Made Easy” to the Fort Lauderdale community. The restaurant has opened to rave reviews of its wide assortment of authentic Italian classics made from traditional family recipes and top-quality, fresh ingredients. Ranging from lightly breaded Eggplant Parmigiana topped with house-made marinara and creamy mozzarella to the mouth-watering “Sunday Feast” (meatballs, sausage, and pork rib slow cooked in tomato sauce over a bed of rigatoni), Anthony’s Pronto Kitchen has something for everyone. Anthony’s Pronto Kitchen is located at 656 N Federal Hwy Fort Lauderdale, Florida 33304. Hours of operation are Monday through Thursday, 11:00 a.m. until 9:00 p.m., Friday and Saturday 11:00 a.m. – 10:00 p.m., and Sunday 11:00 a.m. – 9:00 p.m. The main telephone number is 954-289-3685. Order online or over the phone. For career opportunities, visit Anthony’s Pronto Kitchen Facebook page at https://www.facebook.com/pg/AnthonysPronto/jobs/ or attend their weekly job fair hosted on Saturdays.